A phenocryst is a large crystal which visually stands out compared to the rest of the minerals. Phenocrysts are found in porphyritic textures where large grains are visible in volcanic extrusive rocks. Imagine hiking in Colorado when you come upon a rock with crystals, phenocrysts to be exact, the size of your fist. These phenocrysts are part of a larger porphyritic texture that grows under slow conditions, forming large crystals. Whether you knew it or not you’ve seen phenocrysts and porphyritic textures around in your everyday life. Granite is a great example of this, some of which have large and well-defined crystals. Let’s take a step back and discuss a brief overview of minerals, crystals, and rocks. That way we will lay the foundation for understanding phenocrysts and other porphyritic textured rocks. Minerals are essentially the legos that make up the rocks we see today, they combine together to give a variety of textures, chemical compositions, and properties for each specific rock. To be a mineral, a substance must be naturally occurring, inorganic, solid, have a definite chemical composition, and have an ordered internal structure. This means while quartz is a mineral, while plant tissue (organic) is not. Crystals are a more generic term for a substance that has an organized internal structure. Meaning, the crystal lattice within the substance is rigid and consistent. However, a crystal does not have to be naturally occurring or inorganic. Therefore, all minerals are crystals but not all crystals are minerals. Now that we have the building blocks sorted, we can discuss the final result, a rock. A rock is an aggregate of one or many minerals. This aggregate of minerals forms one of three main types of rocks: igneous, sedimentary, and metamorphic. You have certainly seen granites before with visible phenocrysts, this is a rock largely made up of quartz, feldspar, and biotite. Phenocrysts, as with any other rock forms from the cooling of molten rock or magma. There are primarily two drivers that determine the crystal size of minerals within a cooled and lithified rock. One is the rate at which the magma cools and the other is chemical composition. The predominant factor is the rate of cooling, where the magma either cools rapidly or slowly. This will drive the size of individual mineral crystals. Here we can look at two cooling scenarios. Definition A phenocryst is visible large crystal embedded within a fine-grained matrix of smaller crystals. This combination of matrix and phenocrysts forms a porphyritic rock texture. Rapid cooling can be a volcanic eruption where magma is ejected into the atmosphere, comes into contact with cool air or water and lithifies immediately. In this scenario, there is no significant time for the magma to cool and thus the specific minerals are largely indistinguishable. An example of this is pumice or basalt as it erupts into the ocean. The resulting rock is largely uniform without visible differences in minerals as perceived by the naked eye. An example of slow cooling could the slow exhumation of a magma chamber through erosion of the overlying bedrock. In this scenario, the magma never erupts to the surface, it simply sits in the magma chamber and the overlying rock and soil are eroded away over the course of millions of years. This scenario gives the magma millions of years to form large and impressive phenocrysts. Eventually, the overlying rock is eroded away and the magma chamber is at the surface of the Earth where we can see the impressive phenocrysts. Another hypothesis is that megacrysts form by textural coarsening. In this scenario, the larger grains continually grow whereas smaller grains are dissolved and reabsorbed into the magma. Thus the larger crystals are favored and smaller grains reabsorbed, this allows the larger grains to continue to grow larger compared to nearby grains. There are a variety of sizes of phenocrysts from microphenocrysts to mega-phenocrysts and it is possible to find the entire range in a single rock. The size as noted above is largely due to chemical constituents available and the rate of cooling of the molten rock. In comparison to phenocrysts, a similar large single crystal found in a metamorphic rock is called a porphyroblast. How Does Porphyritic Texture Form? 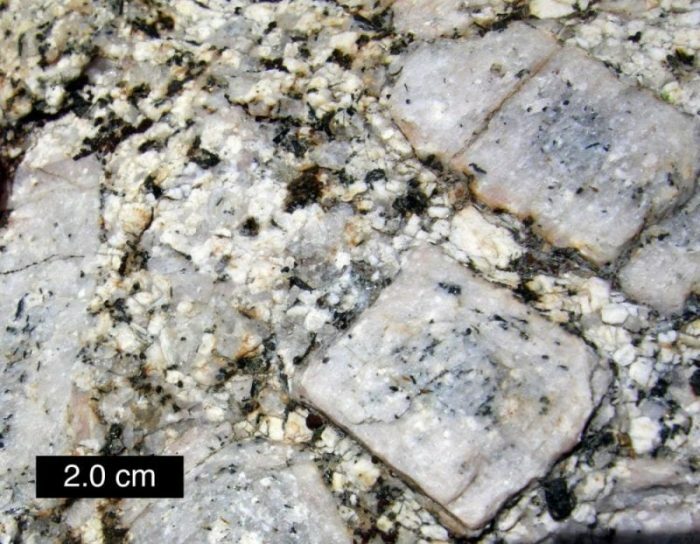 Now that we’ve covered phenocrysts let’s talk a bit about the general porphyritic texture. As noted in Rocks and Rock Minerals, a porphyritic texture is one where there are distinct size differences in crystals with larger and smaller groups. This is specific for igneous rocks, which are rocks formed from lithification of molten rock. 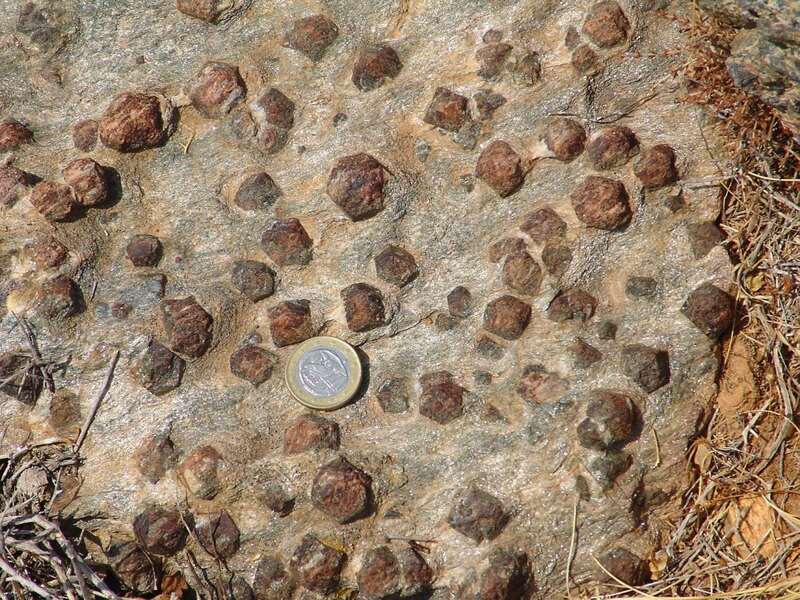 A porphyritic texture is the texture of a rock with large phenocrysts and a background matrix of smaller crystals. To form this crystal contrast of smaller and larger minerals the rock likely went through different stages of cooling that formed different sizes of minerals. During formation of phenocrysts, the magma was cooled slowly giving time for large crystals to grow. Then, during late stages of lithification, the magma was rapidly cooled, forming smaller crystals as the matrix surrounding the phenocrysts. 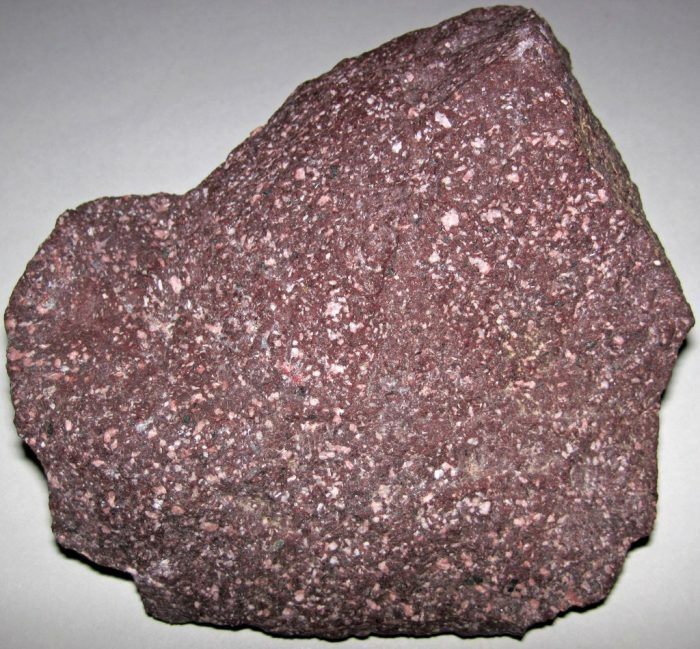 One example of this type of porphyritic texture is a porphyry, an igneous rock with large-grained crystals interspersed with fine-grained usually silicates. You will notice porphyry used in ancient sculptures in Imperial Rome as this was a prized rock for its hardness. Two types of porphyries are aphanites and phanerites. An Aphanite is an igneous rock composed of phenocrysts and a background matrix. However, the background matrix cooled so quickly that the mineral crystals are undetectable by the naked eye. This would be a scenario whereby the magma was ejected during a volcanic eruption. Aphanites may contain plagioclase feldspars, biotite, quartz, and orthoclase in the fine-grained matrix, along with hornblende or augite. The other type is phanerite, a similar rock to an aphanite but the adjacent crystals next to the phenocryst had enough time to cool large enough to be visible to the naked eye. A good example of this is granite, especially many granites you see on your neighbor’s countertops. That wraps up our summary of phenocrysts and the larger category of porphyritic textures found in porphyrs. While the naming convention can be confusing and a lot to take in initially, they are descriptions of how geologists interpret the history of a certain rock. To summarize, below are definitions of the various terms we used in the article above that apply to phenocrysts. Knowing the mineral constituents of a rock along with the relative size of crystal grains compared to one another a geologist can piece together the larger evolution of an associated volcanic structure or magma chamber. This is a perfect example of how small-scale details such as the size of mineral grains and their association to one another can provide large-scale conclusions on volcanic history of a region.